A week after a bizarre street race on Detroit’s Belle Isle course, the 2012 IZOD INDYCAR Series is taken into another unusual situation for the 7th race of the year. Only the second oval race of the 2012 season where drivers are still acquainting themselves with new Dallara racing machines, the Firestone 550 at Texas Motor Speedway is the first time the new vehicle configuration will run on a highly-banked circuit. 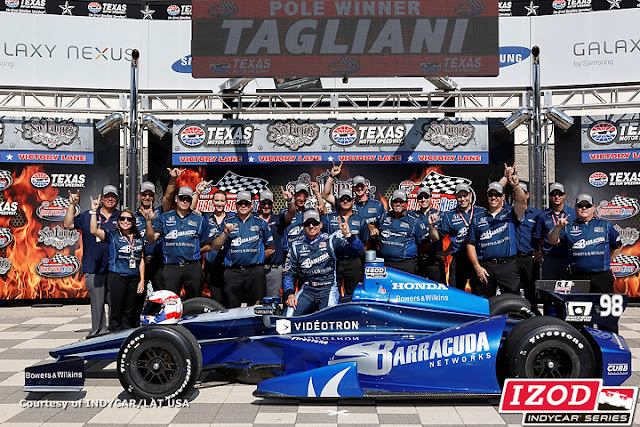 For the second year in a row, Canada’s Alex Tagliani was the toast of Texas in the time trials for the IZOD INDYCAR Series’ Firestone 550 at the 1.5-mile oval in Fort Worth. Last year winning the pole with Sam Schmidt’s team, it was Tagliani and the combined effort of the #98 Bryan Herta Autosport team that mustered a two-lap average speed of 215.691 miles per hour to take the top spot for Saturday night’s 228-lap event at the Texas Motor Speedway. Beating the #10 car of Dario Franchitti by a thin 0.01 second advantage, the #98 car’s pole is only the latest indicator for an emerging force to be reckon with on the IZOD INDYCAR Series tour. Since being dropped by engine supplier Lotus at the end of the Long Beach event, the Bryan Herta Autosport team returned to the Indianapolis 500 with Honda’s formidable powerplant. After a stable Indy 500 for the team, Alex Tagliani delivered the #98 car into the top-10 at the Belle Isle for the highest finish in the 2012 season for the team. “Wow that is so great, back on the pole at Texas! I told people after we sat out the race in Brazil that our season started in Indy and it did, with Honda power.” said Alex Tagliani after qualifying adding confidence that his team will be a threat for the Firestone 550. From 2nd through 4th, Chip Ganaasi-owned race cars of Dario Franchitti, Graham Rahal and Scott Dixon will be lined up on Saturday night planning to display their dominance showed in the first race of the double-race last season at Texas Motor Speedway. With the Firestone 550 integrated back into a single race for 2012, the Texas Motor Speedway event will not have the disputed second race lottery that proved costly for Franchitti and Dixon in 2011. With Chevrolet power showing the way through the beginning of the 2012 IZOD INDYCAR Series season, the improved forces of Honda teams have begun to displace the bowtie’s early path of success. Will Power leads in the #12 Team Penske car in 5th place leads the Chevrolet runners that occupy 4 of the top-10 spots in the Firestone 550 starting grid. Andretti Autosport’s #27 car piloted by James Hinchcliffe and Tony Kanaan in the #11 KV Racing Technology vehicle are Chevrolet drivers right behind Power’s #12 car while Marco Andretti is placed 9th on the grid for the Saturday race. Losing 10 grid positions after engine changes at the previous Belle Isle race will be the HVM Racing #78 car of Simona de Silvestro and the AJ Foyt-owned #14 driven by Mike Conway. The Firestone 550 at Texas Motor Speedway will start at 8pm on Saturday night.